The book is so completley engrossing and uplifting, to read the raw truth and honesty of her feelings and experiences, so many feelings that we have all had and then to hear the incredible, insightful and yet ‘knowing’ answers is so wonderfully rewarding. I love how she talks to the angels as ordinary, everyday people. Victoria is very funny and the book is a joy to read. It is truly entertaining and engrossing and yes definitely can change ones out look on life and indeed Change your life. Bravo for a friggin great read. I highly recommend this book to anyone seeking higher spiritual development. The Angels are wise. Read this with an open mind… peace and joy will follow! When Victoria walked into my yoga studio with such beautiful energy, I knew that an angel had landed. “Are you an angel? I asked. She smiled. I felt happy, safe, and much loved in her radiant presence. I was overwhelmed when I read her previous life in “Angel in Disguise?” The distress, struggle, and pain she had experienced in the past. At present, I only see an angel smiling and warming my heart completely. Her book is truthful, bare, emotional, and fantastically funny. Although the reality is harsh and mostly unpleasant, Victoria has risen from above with the aid of angels. The book is mystical, spiritual, and most importantly – real. Indeed, Victoria is an angel in disguise. I am privileged and delighted to recognize her under those stylish clothes and fabulous jewelries. Victoria, rock on! As a memoir about life in rock n roll’s inner circle, Angel in Disguise stands out for its sheer, raw honesty. In an industry predicated on cool, most people try to maintain some form of mystique. But … while this may sell records, it tends to make for a boring book. Victoria, on the other hand, is brave enough not to hold back her emotions and motivations, even the embarrassing ones. Though she’s close to Nick Cave, Shane MacGowan, practically every other icon in music’s pantheon of coolness and even Johnny Depp, she doesn’t try to create more mystique around them or herself. To me, she deserves a lot of credit for revealing herself so fully, since opening yourself up to everyone’s judgment is a difficult thing to do. The other special aspect of this book is its angel wisdom. Victoria does channeling, a form of meditation where you get quiet and centered and wait for messages from the higher realms. Since angelic wisdom is articulated to benefit as many people as possible, anyone can try the exercises that the angels suggest to Victoria. If you don’t believe in angels, no worries — just treat the angel advice as if it were advice given by anyone and then judge it on its own merits! 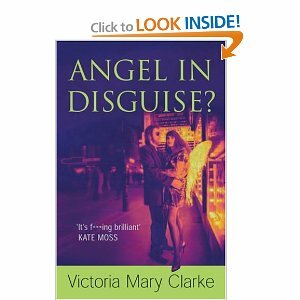 A book about angels may cause some to raise a cynical eyebrow but this book avoids any kind of obvious pigeonhole. 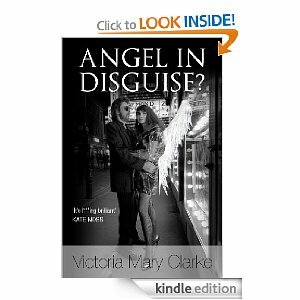 In fact it details Victoria Clarke’s journey of self discovery: from her lowest moments and learning through her mistakes with these non interfering beings that gently guide her in the right direction to where her self confidence is rebuilt. 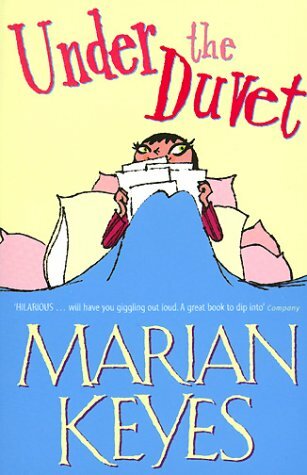 This book is self affirming – the books tone is both self depreciating and warm as is Victoria herself. Although that character Ronan seems a bit of a scoundrel. Victoria was in a slump, she had left Shane McGowan, had moved to Dublin and was in a funk when she started communicating with Angels. A woman not unfamiliar with mysticism and who had explored a lot of different ideas and religions she still finds this a little baffling. Still she went with some of the suggestions and found that her life improved. This is her diary. Some of what is suggested is pretty obvious but sometimes it’s the way it’s said rather than what is said that can help a person move in their life. I suspect that many who pick it up will only be looking for gossip about her fiancé, Shane MacGowan. It isn’t there. It isn’t necessary. The result: Yes, Victoria, you really are your own celebrity, a word with a number of mixed and conflicting definitions and nuances. She is a successful journalist and a woman with an unforgettable life story – a Generation X-er and a daughter of hippies who grows to maturity in the shadow of one of the greatest poets and personalities of rock `n roll, an “older” man and a Baby Boomer. The book tells her life story intermingled with her yearning for the spiritual. She takes her experiences and challenges of faith to a higher level by contacting her own angels. They are not chubby Victorian cherubs on greeting cards. They are plural, ethereal, encouraging and non-interfering. She struggles with her own perception of what they really are – a figment of her subconscious? Is it a ruse to lead her on the wrong path? They are neither. She takes the book into yet another dimension challenging the clutter and overabundance of “stuff” in her life. Like a particularly hip Flylady, she grows wiser and more discerning as time goes on. She learns to make the right choices and learns to believe in herself. Clarke also has to temper and manage her wordly side and her inner quest to be famous for her own merits, and not of the famous and glamorous company she keeps. She really is a “good” girl – she naturally wants to make the world a better place and leave a gentle and well-tended path in her wake. She wants to do things for others and make a difference, but she still feels guilt about her worldly interests – looking great, having nice things and pleasuring her physical and emotional senses. She wants to be a celebrity, but she doesn’t like being stared at. She will learn to live with it. In some ways, Clarke is a modern-day “Franny.” She yearns to allow herself to be optimistic, to make her own pilgrim way through this complicated world that we all inhabit.